Billy to parents and friends, lived at 2, Prospect Place, Eton Wick. This row of tiny cottages with only one room upstairs and one down was situated between The Three Horse Shoes and The Grapes (now The Pickwick) public houses. The 10 cottages were some of the oldest homes in the village at that time, and they originally shared one well, one pump and one toilet. A toilet block, about 20 yards behind the houses, and piped water had probably improved conditions before the Payne family moved there in 1905. Billy was born on December 20th 1893 and attended the Clewer St. Stephen's School until moving to Eton Wick at 11 years of age. He then attended Eton Porny and left school at Christmas 1907 when he was 14 years old. For the next six years he was in the employ of Sir Courtauld Thompson until he joined the army at the outbreak of war in 1914. He enlisted in Edinburgh, presumably because he chose to serve in a Scottish Regiment. Initial training with the 11th Battalion, Royal Scots was at Borden near Aldershot, until May 1915 when they embarked for France. They were involved in the Battle of Loos fighting four months later, when many casualties were sustained. On September 27th the British released chlorine gas, but a change of wind blew the gas back into the advancing troops causing other casualties. Billy Payne achieved quick promotion, yet only had another six months life ahead. By then he had attained the rank of sergeant. The early months of 1916 brought intense reinforcement of arms and men in readiness for the forthcoming Somme offensive. At this time the heaviest fighting was between the Germans and the French at Verdun. Even so the British policy was one of constant night raids into enemy positions, and regular artillery bombardments. Billy was engaged on one of these patrols through Ploegsteert Wood on March 12th 1916 when he was killed. The wood continued to be partly held by the enemy for another year, until in 1917 they were driven out, only to be back in possession again in April 1918. 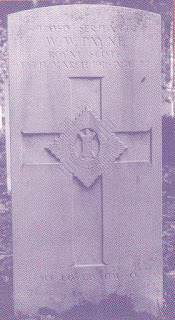 Obituary - Walter W. Payne - "Dear Mr Payne, doubtless by this time you will have heard the terrible news of the death of your gallant son. It is my duty during this war to experience many partings, and I always find that the Almighty for his good reason takes the best first. I feel absolutely convinced that he is in absolute happiness at the present time; it is not for him we sorrow, but for the people he leaves behind him. I feel his loss greatly, and I thought so highly of him that I intended to get him a commission. He was always such a sunny cheerful person, and one for whom I had the greatest admiration. He died as he lived - Splendidly." So wrote the Colonel of Sgt W.W. Payne. 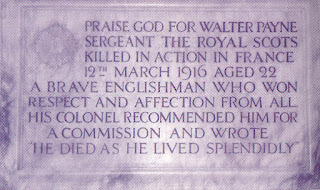 Eton Wick - The Tablet in memory of the late Sergeant Walter Payne, given by his late employer, Sir Courtauld Thompson as a token of esteem, was dedicated by the vicar at a memorial service held on Wednesday October 11th 1916. 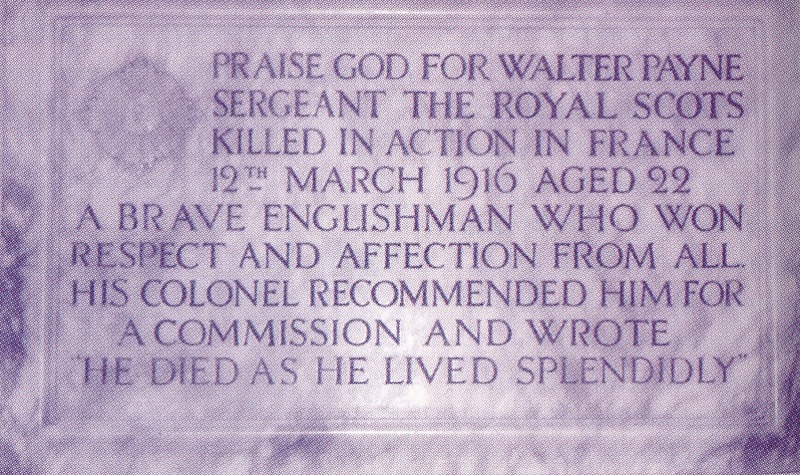 The tablet bears the inscription - "Praise God for Walter Payne, Sergeant, The Royal Scots, killed in France 12th March 1916 aged 22. A brave Englishman who won respect and affection from all. His Colonel recommended him for a commission, and wrote - He died as he lived - Splendidly'. A Belgian flag belonging to the late Sergeant has been presented to the church by his parents, and is now placed in position near the memorial. In Memoriam Payne - Walter William. 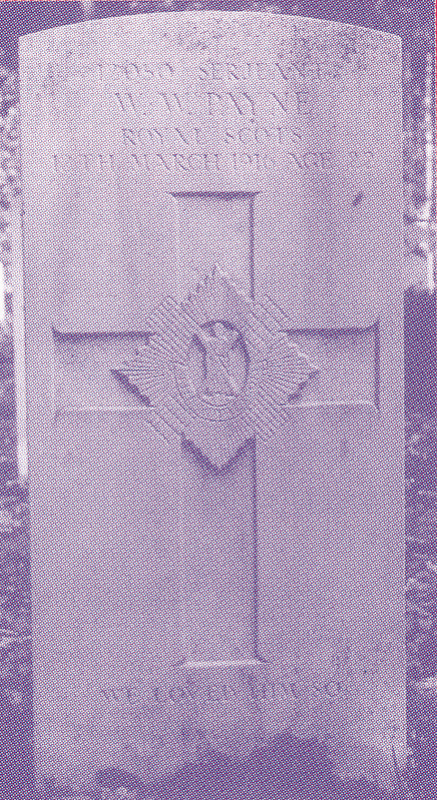 In loving memory of our dear "Billy" of the 11th Battalion, Royal Scots, killed in action on 12.3.16 while on patrol in Ploegsteert Wood, Belgium. Buried in Rifle Cemetery Belgium. He was one of those people who are faithful in all they do, a good son, a good servant, a good soldier and a good Christian. He enlisted in August 1914 and his fear during training was that there would be no fighting left for him. At the very moment he was killed, he might have been safe at the base after being in hospital, but wrote: "I must get back to the boys." There was something peculiarly loveable about him, and his frank, fearless looks were a true index of his character. Our sympathy goes to his parents in the loss of their only child, but we also share with them their pride in his good life and the gallant death by which he has gone to his God, R.I.P. The Rifle Cemetery (Warneton) is one of several in Ploegsteert Wood, not far from Armentieres. It is a small cemetery containing 230 burials from the Great War and apart from one Canadian they are all from the United Kingdom. Walter "Billy" Payne was not married. In addition to his personal memorial in the village church, he is also commemorated on the Eton Wick Memorial and on the Eton Church Memorial Gates. Michelin published a series of illustrated guides to the battlefield in memory of their their employees who died for their country. The series includes Ypres and the Battles of Ypers.